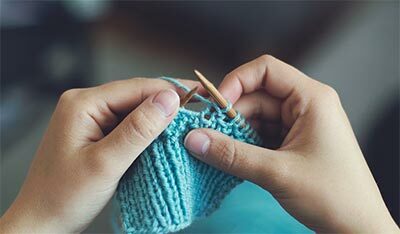 There are knit and crochet guilds across the country that link over 15,000 people who enjoy these crafts and get together to exchange ideas and share information. They often have special teaching programs for people who want to learn to knit or crochet. Many of these chapters are affiliated with two national organizations: The Knitting Guild Association (www.tkga.com) and the Crochet Guild of America (www.crochet.org). Whether it’s a guild or informal group, new knitters and crocheters are welcome to share ideas and the fun. It’s a wonderful way to learn new stitches, and to find answers to problems. Join Today! 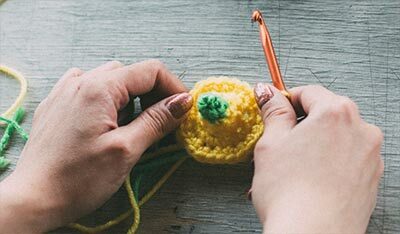 At lunchtime in the office, at church or at once-a-month meetings, crocheters and knitters are carving out small parcels of time to pursue their favorite hobby. They meet with friends who share their interest, relax as they work on their latest knitting or crochet project, share ideas and help each other. Sound like something you'd enjoy being a part of? There are hundreds of such groups that meet regularly around the country, many of them members of TKGA-The Knitting Guild Association and CGOA-Crochet Guild of America chapters. If you are not sure you are ready to join TKGA or CGOA, consider starting your own small group. Here are some ideas on how to get started. a. Talk to a core group of people who you think would be interested in starting a club. Depending on the size group, ask these people to reach out to others. b. Set a meeting date and ask everyone to bring something to share. It can be a project they have completed, a project they are working on or an idea for a project. This is a great way to "break the ice" and a great conversation starter. bring in a yarn you particularly liked or that was especially suited for children's projects, etc. a. Adopt a group charity project, e.g., knitting/crocheting preemie caps for babies in the hospital or Warm Up America! b. Group projects are a wonderful way to raise funds for your favorite pre-school. Masters Program for members and non-members. Discount for members.